Simple and an inexpensive Security Patrol Tracking Solution using an easy-to-use barcode scanner This application assists with verification of security checks being carried out. The data will indicate to an employer that the patrols are being carried out correctly, and can be used to assist with client billing and payroll. In order to use this application the locations to be patrolled must be barcoded. 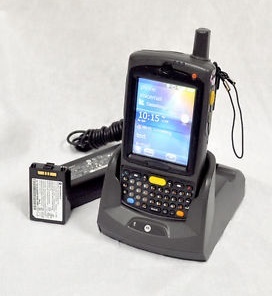 This package complete includes Hand-held Mobile Computer Terminal, Cradle with Comms / battery charger and USB interface cable. Simple and an inexpensive complete kit improves efficiency and makes your company more competitive. This solution can be customized according to your requirement, so please provide the specification with the purchase order.